It is impossible to ignore the downward spiral of discourse and debate in American politics over the last year. Teachers pay special attention to public discourse because they know that what happens at the higher elevations of society always trickles down to their students. How adults in leadership speak to and about each other will be reflected in the schools. Whether students are influenced by the adults in their homes or on tv, it’s important to realize that teachers will be left to deal with the toxic aftermath of what has become normalized in society. 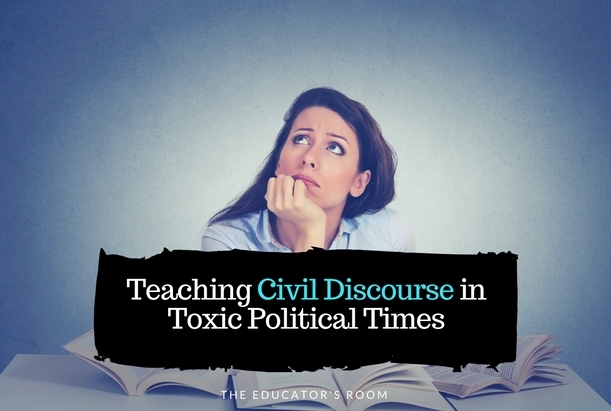 Here are some examples of what civic discourse has become, and following that, five tips on how to detoxify discourse in your classroom. We just completed two weeks of political party conventions, where our country’s leadership and potential leadership was on display. Most younger students won’t have watched the conventions, but their parents may have, and many older students might have watched. Hopefully teachers watched because every election matters when you are responsible for educating the young people of this country. The conventions give us a good view into the kind of language being used by adult leaders. 1 – Don’t set students against each other. Create an environment where every student’s opinion matters, but where each student has a voice, even when they disagree. Teaching students to use “I” statements is a great way to establish this habit when you engage in classroom conversation. 2 – Immediately intervene to stop derogatory terms or name calling. You are the boss of your classroom and you must advocate for tolerance and acceptance. That means not accepting name calling or terms that hurt or harm. Those aren’t opinion; those are verbal weapons. 4 – Give students an opportunity to explore controversial topics. It doesn’t help to shelter students from the controversies that live in our society. Rather, helping them to engage with the topics, find reliable sources, and talk about ideas will give them the tools to engage those around them in dialogue as they mature. 5 – Don’t see the other as “enemy.” Too often we see in political debate or discourse on television that people see each other as enemies. Teach your students that no one is their enemy if they are willing to engage in dialogue and learn from each other. Starting with our students, we can help build a healthier society where dialogue triumphs over name calling, and people learn from each other rather than tear each other down.